With the holidays quickly approaching, it's time to start knockin' out those hand-made holiday cards! This year, I have promised myself that they will arrive before New Year's!! The A Muse News blog is hooking you up all week with some Fast & Fabulous Holiday Card Designs, so be sure to check all week and see what all the awesome Muses have come up with!! 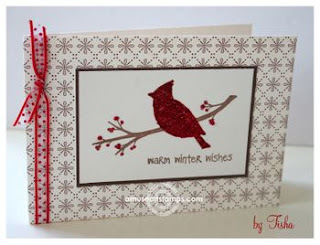 This card was inspired by my desire for a "natural" Christmas - I'm picturing lots of burlap, jute and red!! The solid Cardinal Silhouette makes for some quick one color stamping, then I just went over the brown cardinal with a quickie glue pen and dumped on some Red MS glitter. I highlighted the berries with a red copic and added just a couple tiny Cranberry Pretty Pearl stickers! A quick sentiment and it's done! I kept the layers to a minimum, used A Muse note cards (no cutting or scoring! ), and added a simple ribbon for accent! This card was super quick! Here are the steps that I would take to mass-produce these babies! 1. Cut all pieces of natural white card stock to size. 2. Cut all pieces of French Roast card stock to size. 4. Color all the berries using a red copic. 5. Adhere natural white and french roast layers, adhere to base card. 6. Tie on ribbon. Place Pearls if using. 7. Use a Quickie Glue Pen to cover the bird, apply glitter and shake off all excess. 8. Set all cards aside to dry and treat yourself to a nice beverage of your choice cuz you are done!! 9. Put cards in envelopes and actually put them in the mail!! !